Based in west central Minnesota, Heartland Symphony Orchestra presents a Fall, Winter, and Spring series with concerts in both Brainerd and Little Falls. Heartland Symphony Orchestra will present their winter concert on Saturday December 1 at 7:30 p.m. in Little Falls at the Charles D. Martin Auditorium and December 2 at 2:30 in Brainerd at the Tornstrom Auditorium. A highlight of the concert will be the performance of Howard Blake's "The Snowman" as narrated by Bill Satre. The theme song will be sung by Jennifer Pelowski. The program will also include music by Saint-Saens, Strauss Jr., and Tchaikovsky. 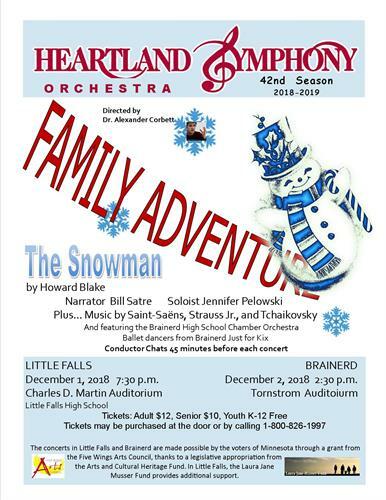 The Brainerd High School Chamber Orchestra and dancers from Brainerd Just for Kix will join Heartland Symphony Orchestra for this holiday celebration. 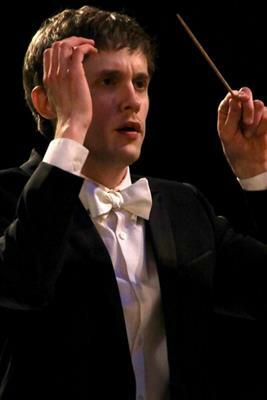 A Conductor Chat will be held 45 minutes prior to the concerts. Tickets are $12 for Adult, $10 for Senior and Free for Youth K-12.